Today I just thought I would quickly share with you my outfit for the day. I managed to get outside between all the rainy spells, but it never managed to stop being windy for even 10 seconds so I could get some decent photos where my hair isn't everywhere... Stupid wind. Either way I wanted to try a little something different today. 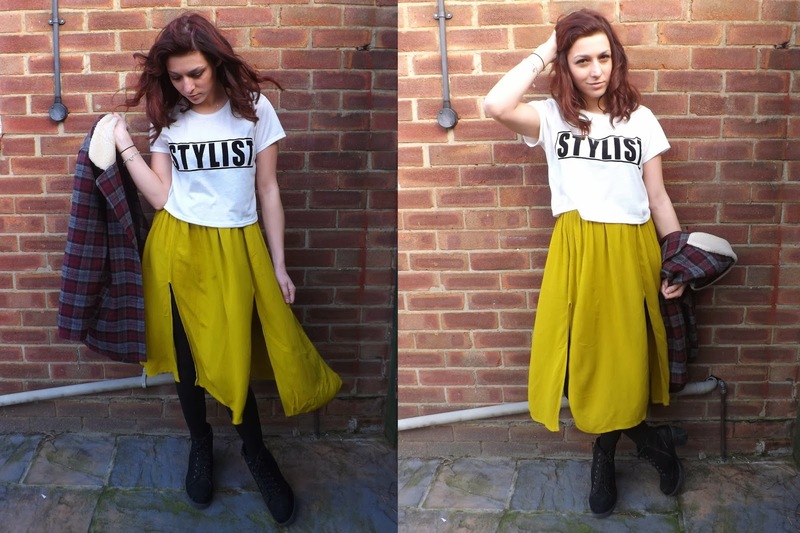 I'd pulled out this skirt from my wardrobe after realising how long it's been since I wore it, and though it's not a lot of people's favourite colour, I still love it. I also love the length and the cut of it. 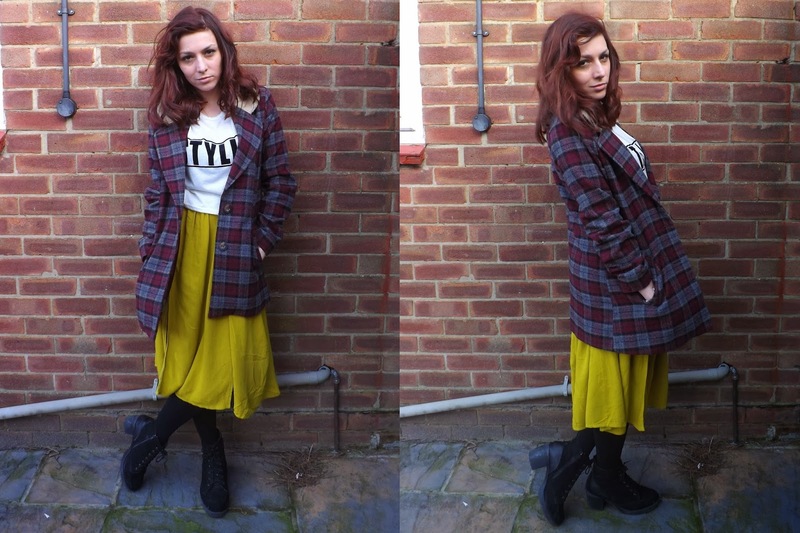 Pairing this outfit up with my coat was a bit of a gamble and my mum said it didn't go very well, but I remembered a A/W13 trend for Miss Selfridge and disagreed a little bit where I paired this coat with a jumper similarly coloured to the skirt. I was going to go for my leather jacket which I just realised I still haven't featured yet, but I wanted something a little bit outstanding and different. I love experimenting with new styles. I also wanted to wear my new crop top that I bought on Friday. I'd got this in my Miss Selfridge delivery this week and was super-excited about it, having a thing for white tops with graphic prints on and bought it the next day. It's one of those bargain tees at £14 and I couldn't resist it. It's a bit of a statement to be making about myself but I thought: "Bugger it! I love it, I want it." I'm also thinking of wearing the crop top with something different to the Voucher Codes Blogger Swap Shop Party on the 24th of this month! Who else is going? It's my first proper blogger event so I'm a bit nervous about it. I'm also going alone and don't know anyone yet, so I'm hoping I'll really get on with a few of you girls and make lots of new friends. I'll see some of you there! That skirt is absolutely stunning! The colour is so unusual! I love this whole outfit..